fishing in this part of the world can be outstanding with many of the marks closely-guarded secrets, fished by only a handful of locals. 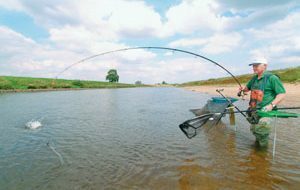 In summer the beaches are popular with day-trippers but even on the busiest day there is plenty of room for anglers as well as sunbathers. The beach marks will produce plenty of mixed flatfish with flounder the main quarry. During winter, these same beaches still have a good head of flatties, which will be joined by codling, coalfish and the occasional bass. 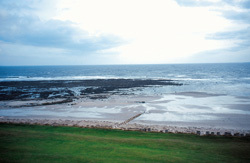 Situated at the mouth of the River Coquet the pier is a superb all-round fishing mark producing a wide range of species. It is about two miles from the nearest car park and as a consequence is never crowded. From June until September anglers target the mackerel shoals and launce that move inshore; catches of 30 fish a session are quite common. As the autumn weather sets in, the heavy seas can make this mark very dangerous, so great care should be taken. During calm conditions good catches of mixed flatfish, codling, coalfish and eel are made, with ragworm and peeler crab the top baits. Drive through the village of Warkworth and take the first right once over the River Coquet. This will bring you to a large car park, which is situated on the hillside overlooking the sand dunes, midway along the beach. The beach is approximately four miles long and throughout the year will produce good catches of flounder, turbot, dab and occasionally bass. During the hours of darkness, if there is a good sea running, codling can show in good numbers with lugworm the best overall bait. The rocky skeers situated midway between Warkworth and Alnmouth are known locally as Killiecrankie but on the Ordnance Survey map are called Birling Carrs. At low tide the exposed rocks go out for some distance and can produce a mixture of flatfish and weed-coloured codling, with fresh peeler crab the best bait. The rocky skeers form a number of sandy bays and these produce some outstanding catches of flounder. 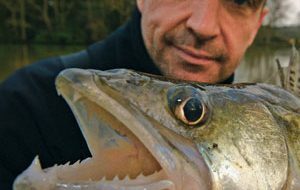 Most baits will take fish, although the essential ingredient is to tip off with a chunk of mackerel or a sliver of sandeel. The estuary is a brilliant flounder mark with fish to 2lb taken most years. During the summer the river can produce huge bags of flounder, eel and the occasional dab, with fresh peeler crab the killing bait. Many of the Tyneside angling clubs hold pegged matches on the banks of the river, fishing over high tide and using the marks near the road bridge. In winter, although activity slows down, the marks will still give good sport with lugworm and mackerel strip the best baits. This is a very long, sweeping beach which at low tide has a series of sandbanks forming a delta at the mouth of the River Aln. These produce good catches of flounder, bass and codling. There is generally surf running where the river meets the sea and this movement seems to attract the fish. In the winter months this is a popular beach with Alnwick AC members and evening sessions can produce some excellent catches of cod to lugworm baits. The mass of weed-covered boulders and flat, rocky skeers known as Marden Rocks are perhaps the most under-rated marks in the region. In the summer when the weather is hot these rocks produce some outstanding catches of red codling, with fish to 5lb possible. Other species include coalfish, pollack and bass. The best time to fish here is on big spring tides when the full extent of the rock edges are revealed and the gullies can be fully exploited. By far the most successful offering is a big peeler crab bait. Jobsons Of Alnwick, Tower Showroom, Alnwick, Tel: 01665 602135, E-mail: fishing@jobsonsofalnwick.co.uk . Make sure you tip off your baits with a chunk or sliver of mackerel or sandeel for the best results. Try using a small lead to make a spinning rig for working frozen sandeels around the rocks in search of bass.